Wow! Two posts in one day! As long as I was making cards with this paper, I thought I'd use it up. It was fun working with the chocolate and creme brulee of this paper packet. I was inspired by a sketch over at Deconstructed Sketches for this one. I particularly like this dark chocolate grosgrain ribbon. Isn't it pretty? It is 1-1/4" wide, and makes a really nice bow. 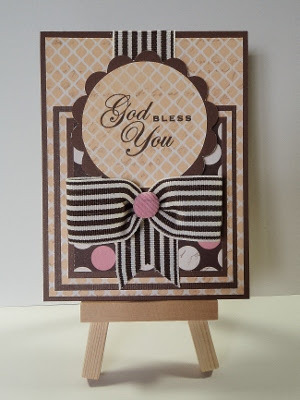 The sentiment is from Card Chatter - Sympathy, and really, it's quite useful for many occasions. Now, I've had my play time so it's back to work. It's great that as my own boss, I can take the time for some random creativity in a day. What's even better is that my "work" means creating some more!! I LOVE my job! Love that bow! Very fun w/ the stripes going two directions. Your summer classes look so inviting. Wish I could attend! Love the card. The bow is delish!